The one activity that sets the US Marine Corps apart from all others is its primary role of combat amphibious landings. With that mission the Marines have fielded some of the most unique and innovative equipment in military history. Starting with the LVT-1 “Gator” in the early 1940’s, the idea of moving combat ready troops directly from ship to shore in a vehicle that could also continue with the Marines inland has been synonymous with the title “Marine”. The AAVP7A1 is a midlife improvement of the LVTP7, a design started in the late 1960’s and fielded in the early 1970’s. The current designation of AAVP7A1 came about from a series of upgrades done in the early 1980’s meant to extend the service life. 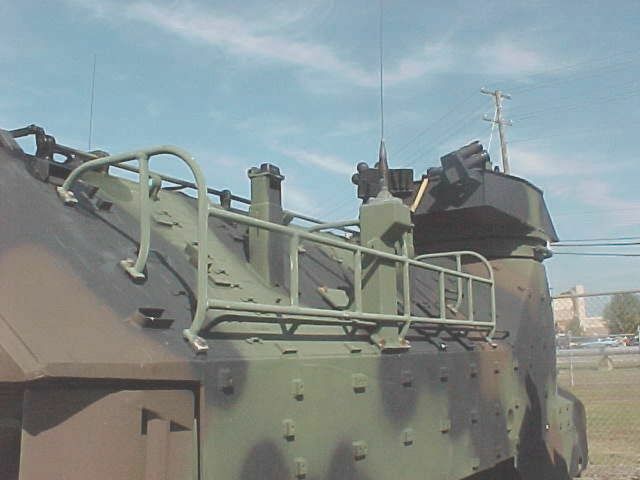 This upgrade improved various elements of the basic design, including various safety features, a new engine and transmission and the addition of a Cadillac Gage Weapon Station. The Up-Gunned Weapon Station (UGWS) sports a 50 cal HBM2 machine gun and the MK19 40mm grenade launcher, optical day and night sights, and power traverse. Additional armor can also be added with EAAK bolt on armor plates. Other improvements were made as needed, such as introduction of SINCGARS radios, GPS equipment, and other minor changes. 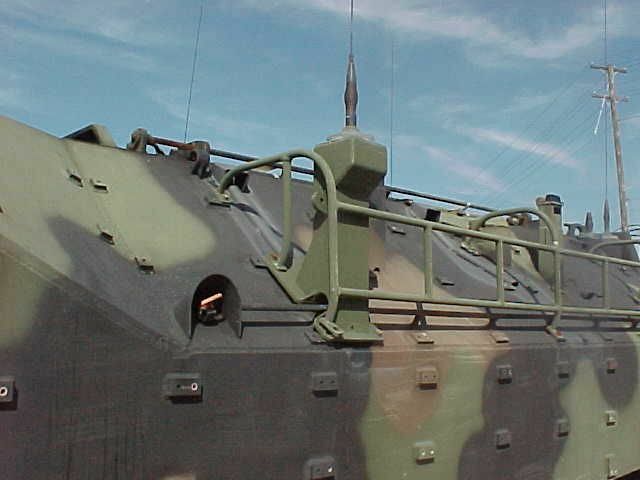 The change of designation to AAVP7 also emphasized the critical part that this vehicle is not just a landing craft, but an Assault Vehicle. It is not as well armored or armed as a M2 Bradley, but the “adapt and overcome” attitude has seen the USMC put it to maximum use. Its 300 mile land range and 45mph max speed has allowed the USMC to use the vehicle as a mobile weapons platform and personnel carrier. Not only can it carry up to 21 equipped infantry, but can also carry special squads such as AT teams, Mortars, and Engineers. The AAVP can also be converted for use as an ambulance or a drop in mine clearing kit (M58 MiCLiC), and also for transporting cargo. The basic design has served with the USMC for over 30 years and is probably one of the most versatile vehicles in the USMC inventory, and now also operated by 5 other nations. •14 sprues of kit parts in a light grey plastic packed in 7 poly bags. •2 sprues of clear parts. •4 sprues of individual track pads. •A small set of water slide decals. •A 65mm length of white cord. •2 pages of fold out instructions. The instructions come on 2 pieces of paper printed on both sides, which fold out to four pages giving you sixteen stages in total. One page is dedicated to the introduction and another the list of contents, each page is a little smaller than A4 size. Each stage is displayed as a black and white line drawing, which in my opinion, are clearly marked out and should not present any problems to a person following them regardless of experience. The only negative I can see about the instructions is that after you have followed the four stages on one side the next four are not on the reverse side, instead you jump over to the other sheet following the build stages on both sides of that before returning to the original page to finish the construction. There are sixteen stages in total which are, of course, broken down into sub stages such as indicated by the pictures of the instruction sheet attached. The main body of the vehicle comes in two pieces, the main tub and the top of the vehicle. The main tub sides are bowed in slightly on my sample, however this should be easily remedied as it is minimal. Some of the internal areas do carry detail for the full interior, there are quite a lot of push out marks on the inner face of the top surface of the model, however it would appear that they will all be hidden when the internal detail is applied. There are 90 sprues each having 2 track links attached, there are no push out marks on either face of each link. Each track link is a very finely moulded and comes with individual track pads to add, I have no idea why the decision to include separate track pads was taken. Each track links is attached to the sprue at two points and a spur also needs removing from the opposite side. It is stated in the instructions that 84 links are required for each track run giving 12 links spare in the box to feed the carpet monster. The full interior really does look the part with a large number of parts coming together to create a very high level of detail along with some finely moulded parts. I have scoured the web looking for pictures of the internal layout of this vehicle with limited success, so a big thank you to Andy Renshaw (SkyHawk) for coming to my aid. The internal layout as best as I can tell is very accurate right down to the fire extinguishers, and a model kit in itself. While there is always room for the scratch builders and tweakers to add a bit of themselves to this model there is certainly no obvious need for it, with the interior taking up half of the instructions to complete it gives you some idea of just how good it will look when finished. The turret is another fine example of modern moulding techniques. 54 individual mouldings go together to make the turret, and I believe it will meet the exacting standards of most, if not all, the people who purchase this model. The gun barrel and grenade launcher barrel have both been hollowed out at the end, which is something I was not expecting. There are surprisingly few pieces to attach to the outer hull of the vehicle, and despite having poured over a large number of pictures (both online and supplied by Andy) I was unable to identify anything missing or out of place. All the mounting bosses appear correct to my untrained eye. The anti-slip areas on this model may be a bit on the under done/defined side, however that will not really be answered until some paint is applied. The photo-etch for this model consists of fifteen parts, with nine pieces for the grill/intake covers and the remainder being brackets. The photo-etch is of a good quality, nicely laid out and clearly labelled with some nice detail. There are no painting instructions provided for the interior, or any colours called out during construction stages, several decals do need applying internally during construction. Externally, apart from the main camouflage pattern, no detail painting is called out or colours suggested. If this model goes together as well as it appears to I doubt that there will be many, if any, that regret buying this kit. The mouldings are all of a high quality and nicely detailed. Anyone who has been disappointed with a HobbyBoss product in the past can put those fears aside regarding this model, it puts HobbyBoss on a par with the all the major manufacturers as far as detail and moulding go. If the other AAVP vehicles that HobbyBoss are releasing are as good as this one, and the manufacturing techniques can be applied to their future offerings in general, you will be hearing their name more often and seeing a lot more of their kits being built. I have not been this impressed with what’s in the box since the all singing and dancing over the Tiger I’s from Dragon. I would like to take the time to publicly thank Andy Renshaw (SkyHawk) for his aid in putting this review together. It has been pointed out in a Blog that the exhaust is shown in the instructions attached the wrong way round, the highest face of the exaust should face towards the front of the vehicle. The drivers hatch stop needs to be attached to the vehicle, and while it is included in the kit parts it is not shown where to attach the part in the instructions. A build log can be seen Here in the Forums. Highs: Excellent kit all round with the ends of the MG and grenade launcher hollowed out, and very nicely detailed interior. Lows: Very, very few judging by the contents of the box, the lack of painting instructions for the interior is the only weak area. Verdict: An excellent model of the AAVP-7A1 which I believe will satisfy most, if not all, who purchase it. Great review really looking foward to starting the build. But has anyone got any idea of a match for the pale green interior walls and can anyone confirm the colours of the floor and inside ramp? The interior color is called SeaFoam Green. Tamiya Sky, Humbrol Sky-S, and Testors Model Master Pale Green with a few drops of white added works well. The floor is painted a very dak green or black. The interior of the ramp and hatches are painted to match the exterior. If camo, then they are dark green. If sand, they are also sand, or can be dark green from a track that was camo and was repainted sand. Thank you for the positive reception of this review. looks like they got it right....now if they could just throw that sprue in the RAM/RS kit!